VHT, the real estate photo giant, filed suit for copyright infringement against Zillow Group in July 2015 alleging that Zillow had been stealing tens of thousands of VHT’s photos and illegally using them for its own profit and gain on the Zillow Digs website. 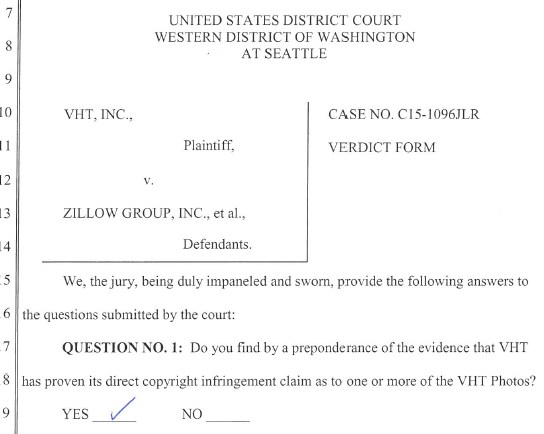 At the end of the two week trial the Seattle jury found that Zillow failed to prove it could use VHT’s photos either under license or fair use and that Zillow therefore infringed the copyrights in 28,125 of VHT’s real estate photos. The jury also awarded VHT $79,875 in actual damages, for a total award of $8.3 million for copyright infringement. Zillow Digs was flagged by real estate photographers early on as a haven for infringement. Many real estate photographers instantly recognized photos on Digs as ones they had licensed for use only in connection with the sale of a specific real estate listing. Zillow believed it was licensed to use the images, or that it was entitled to DMCA safe harbor. Neither defense was successful at the trial. What’s next? Zillow says it plans to appeal. However, the battle will be uphill for Zillow. We congratulate VHT for an important, hard fought win.